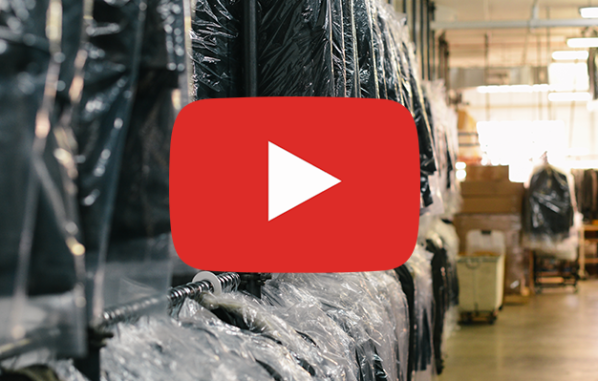 Thousands of dry-cleaning sites across the US are faced with the task of cleaning up TCE and PCE contaminants caused by historic dry-cleaning operations. Most of these sites are located in busy strip mall locations, where the impact of clean up not only affects dry-cleaning operations, but the surrounding businesses. Many sites also require operations be maintained during business hours. 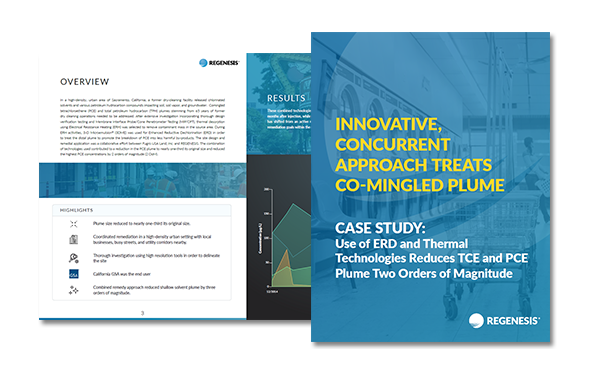 This affects the type of approach and magnitude of remediation that can take place on-site. It is also not unusual to have commingled plumes with both chlorinated solvents and petroleum hydrocarbons at dry cleaner sites due to their relative proximity to petroleum service stations in strip malls and shopping centers. 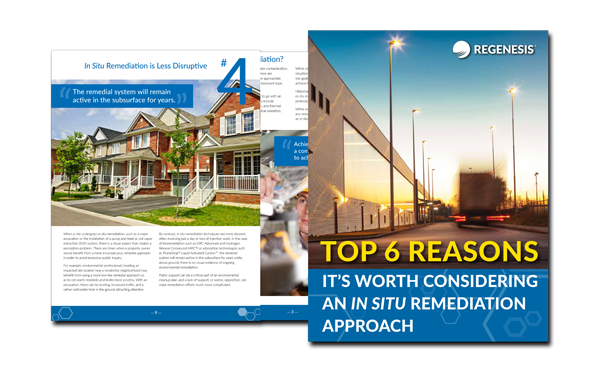 More and more, businesses are turning to a low-impact, in situ approach using REGENESIS’ suite of products to quickly and effectively reduce contaminant levels with limited to no impact on business operations. Soil and groundwater remediation solutions at dry cleaning sites may include the following: excavation of the source area, free-product (DNAPL) removal, soil mixing, groundwater source area treatment, dissolved-phase groundwater plume treatment, plume cut-off barriers, and mixed­plume treatment strategies. These solutions can be achieved using well documented, proven and cost-effective in situ approaches such as sorption, enhanced anaerobic biodegradation (chlorinateds), bioaugmentation, enhanced aerobic biodegradation (petroleum) and/or in situ chemical oxidation (ISCO). REGENESIS provides a range of technologies for use at dry cleaning which include: PlumeStop, 3-D MicroEmulsion, Bio-Dechlor INOCULUM, ORC Advanced (powder/pellets), RegenOx for underground infrastructure compatibility and PersulfOx and s-MicroZVI. Do you have a dry cleaning site remediation project? I am interested in buying an former dry cleaning site. Do I need to test for contamination? As with any real estate purchase, the term “caveat emptor” comes to mind. That is, “buyer beware.” It is important that any prospective buyer complete their due diligence prior to signing on the dotted line. The liability associated with a contaminated dry cleaner can easily exceed the worth of the property and the business. Any purchase of a former dry cleaning site should be accompanied by an environmental assessment report that has been thoroughly evaluated by a licensed environmental professional. How do I know if there is a contamination at my site? Dry cleaner sites are often associated with environmental impacts from chlorinated solvents such as perchloroethylene (PCE). While there may be signs on the surface of spills, the only way to determine conclusively if there is contamination on site is by conducting a subsurface investigation of the on-site soil and groundwater. What should I do if I suspect a chemical spill? If you suspect a chemical spill, the first order of business is to first evacuate the area. The spill area should then be contained and the spill reported to the appropriate emergency response office. The area should be secured until the emergency response personnel arrive and can conduct a proper cleanup.